Assemble nylon washer #13 on brass shaft #11. (shaft #11 is plain and has no knurls). Gear #14 is next, the teeth must point in a clockwise direction. line up becoming one. If not, flip one upside down. Pin together with gear #14, (3) spacers #17 and (2) nylon washers #13. Temporarily load top plate #35 onto the (4) uprights #3. Carefully align brass shafts. Check if gears rotate freely, then remove top plate. knurl until they are against nylon washer #13. Lay sprocket #18 flat on the table. Insert (2) steel pins #46 (1 inch long). #18 and #20 must be staggered. If not, flip the top one upside down. 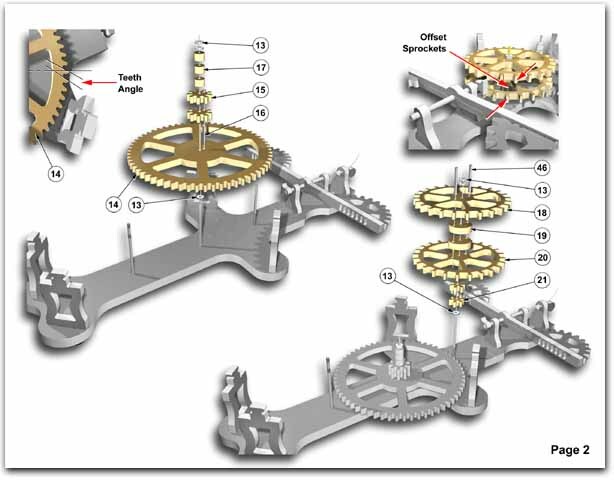 Load this assembly onto shaft #10 and push onto knurl against gears #21. Assemble (2) nylon washers #13.